Posted February 9th, 2019 by Guild & filed under Industry information, News. GUILD members and Exhibitors should have received printed copies of this year’s Guild Trade Show brochure. You can also access the 48-page digital version online by clicking here. 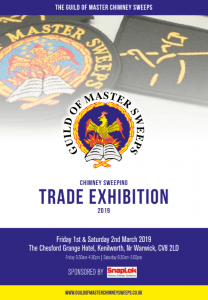 That means chimney sweeping is a flourishing trade and the Guild of Master Chimney Sweeps is leading the way when it comes to supporting local sweeps, educating consumers and informing the wider industry. “We look forward to seeing you at the Guild trade show,” adds Sascha Meding, Vice Chairman of the Guild. “There’s certainly lots to talk about! And lots going on at the show with the AGM, numerous suppliers, competitions, and plenty of food and drink! “Please do take time to browse through the brochure before the event, we have tried to include something for everyone. Have a look at last year’s event – watch this video!